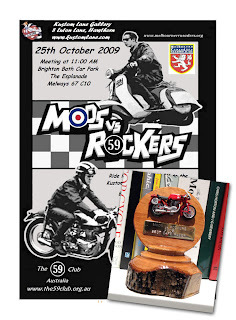 Today I went on the Mods vs Rockers Ride - it was huge and an amazing thing to be a part of. It was my first showing AND I WON BEST CAFE RACER! I'll post some pictures when I find them elsewhere... I was riding.... I couldn't take pictures! best cafe racer thats great! nice on the first showing. better get it out there more ofter. Looks better than a Deus ex Machina, Nick.